"So now we're making a documentary about two guys making a documentary about a private detective, only we're the detectives." Where's Marlowe? is a "mockumentary" starring one Joe Boone (Miguel Ferrer), a down-on-his-luck private eye chronicled by struggling young documentary filmmakers A.J. Edison (John Livingston) and Wilton Crawley (Mos Def.) When his partner Murphy (John Slattery) quits, jeopardizing Boone's agency and the film-in-progress, A.J. and Wilton volunteer to assist him with his caseload; one case develops into more than anyone bargained for. Director Daniel Pyne understands the comedic potential of human aspirations and failures, and he plays Where's Marlowe? straight, allowing humor and drama to grow naturally out of its situations. While the film is scripted, it has a casual, improvisational quality in the grand tradition of This Is Spinal Tap and Waiting for Guffman, though it extends that style into more serious moments. Pyne also allows the mechanics of filmmaking to intrude on and drive the story, using lenses, broken equipment and cameras left running to clever effect. The film's comic precision is camouflaged by its deceptively casual style, complete with mistakes, roadblocks and technical difficulties—it's easy to believe this was a real film project. Cast contributions to Where's Marlowe? are significant—everyone collaborates, fleshing out and practically co-inventing the screenplay. The often-underappreciated Miguel Ferrer is amazing to watch here—wisecracking, emotional and generous to a fault, he presents a detailed, sympathetic portrayal of a private eye beset by oddball clients, desperate for cash and a crack at The Big Case. Ferrer's performance sets the tone for the whole film and everyone rises to the occasion—dialogue is consistently natural and "real," never giving away the fiction beneath the footage. Second City founder Del Close would be proud. Rarely does a comedy hit so many right notes—the style and substance of Where's Marlowe? are thoroughly intertwined and dead on perfect. It's a very funny movie (clips from A.J. and Wilton's earnest but lame first effort, Water in the Apple, are priceless) but it doesn't depend on gags per se—every laugh is honest, and every emotional moment feels genuine. It's a marvelous little film. Image Transfer Review: Where's Marlowe? is presented in its original 1.85:1 widescreen theatrical aspect ratio with a solid anamorphic transfer. The image is intentionally soft and occasionally grainy in traditional low-budget documentary style, but detail and color are well-captured, film grain doesn't confound the compression and there are few distracting digital artifacts. A sequence filmed in 8mm is windowboxed to 1.33:1 within the widescreen frame. Not a reference-quality disc due to the inherent nature of the film, but a fine transfer just the same. 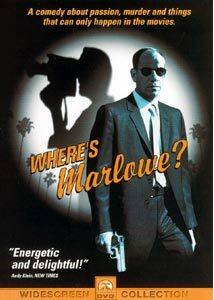 Audio Transfer Review: Paramount provides Where's Marlowe? with 2 soundtracks—a default Dolby Digital 2.0 Surround track, and a full-blown DD 5.1 track. As the film is ostensibly a documentary, dialogue is recorded "live," slightly muddy and almost always centered, though it expands into the other speakers during the 8mm sequence for an innovative "small camera" effect. The surrounds are otherwise used only for Michael Convertino's score and for sound effects, rendered in actively panning surround. Dialogue is occasionally hard to hear due to overemphasis of music and effects, though volume levels are generally consistent. There's not a dramatic difference between the 2.0 and 5.1 tracks—musical bass and frequency range are solid in both, though dialogue is noticeably clearer in the 5.1 track. The digital audio transfer is solid but can't overcome certain limitations of the source. Extras Review: Where's Marlowe? is a fairly bare-bones DVD, with static picture menus and 21 chapter stops. The original theatrical trailer is included, in a 1.85:1 anamorphic transfer with Dolby Digital 2.0 Surround audio—the source print is grainy and noticeably softer than the feature presentation, but it looks and sounds fine overall. It's safe to watch the trailer before seeing the film, as it doesn't give too much away, but I wouldn't recommend watching it JUST before the feature. It would have been great to hear a commentary by the filmmakers and actors involved in this highly collaborative effort—alas, such was not to be. Where's Marlowe? is a fresh, funny "mockumentary" with nuanced performances and humor that will stand up to repeat viewings. Paramount's DVD transfer is excellent, though light on extras, and I hope the film reaches a wider audience on disc than was afforded by its limited theatrical release. Highly recommended.